We take a look at some of the best golf swing trainers on the market. Can they really make a difference to your game? There’s not a golfing soul out there, from the weekend warrior to Tiger Woods, who isn’t trying to improve their swing. When professionals are in need of a swing change they reach for the best coach money can buy. But for those who can’t afford the price of having Hank Haney on speed-dial, finding a reasonable alternative can be a challenge. To the golfers finding themselves in that predicament, then the swing trainer is right for you. 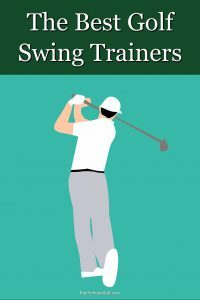 What is a swing trainer? Swing trainers are simple devices that help the golfer hone his swing. What’s terrific about the best swing trainers in today’s market is that they are highly affordable, easy to use, and can be used anywhere. From the backyard, to the office, or even before a round, a solid swing trainer can keep a golfer’s swing ready for action. Most swing trainers resemble a golf club with a normal grip that wraps around a softer, more flexible shaft. At the end of the shaft, a weighted ball is attached to simulate the lag a golfer experiences on your typical swing. Each unique feature of these club-like swing trainers have a purpose. For example, the soft shaft allows the golfer to simulate the “whipping” action, this enabled the golfer to simulate the lag experienced on a typical swing. Why the shaft needs this flexibility lies with the second attachment of the swing trainer. At the end of the shaft is a weighted ball. Swinging with a weighted end allows the golfer to experience the lag of a swing, promoting the proper turn-away and necessary arm pivot to promote solid contact. Of course for the golfer to get the full benefits of a swing trainer they must use the device with frequency. The combination of specially design shaft coupled with weighted ball allows the muscles associated with a golf swing to build and strengthen. So if you are a golfer struggling for consistency and could use help with your full swing, then here are our recommendations for five of the best golf swing trainers on the market today. One of the most popular swing trainers on the market comes from SKLZ. The SKLZ Gold Flex Strength and Tempo Trainer is, first off, very affordable at less than $40. This trainer promotes a patented design that is tailored specifically to fortify the development of sturdy mechanics. Repeated use of the SKLZ will develop the golfer’s core muscles allowing the golfer to create a swing that is easily taken from the range for use on the course. With as little as 10-20 swings a day, the SKLZ gives the average golfer a tool to keep his swing up-to-date and prevent setbacks. A feature that most swing trainers promote is the development of a flatter swing. By creating a swing that is flatter, especially for taller golfers, you will generate more power due to the rotational style of a flatter swing path. The second trainer on our list, the Rukket Red Head Pure Path swing trainer, has been designed to help the golfer create that flatter swing to create more distance on his/her shots. The Rukket features two different models, a 122cm model for golfers of above average height and a 102cm model for those that are average to below average. The 102cm model is perfect for the young golfer in your home. What most golfers love about the Red Head Pure Path trainer is that the weighted ball is larger than most trainers. With the larger dispersion of weight, many feel that the trainer is better suited to practice the necessary shoulder turn for shot distance. If you are looking for the best swing trainer that you may find in the bag of your favorite PGA professional, then the Orange Whip Golf Swing Trainer is the one to add for your weekend round. With a design and construction that many believe represents the best simulation of lag in a golf swing, the Orange Whip trainer is beloved by pros and amateurs alike. Measuring 121cm in length, the Orange Whip Golf Swing Trainer is higher priced than many of its competors but for those who adore this swing trainer, it is money well spent. The award for the most unique swing trainer on the market belongs to the Powerchute Swing for Life Golf Swing Trainer. Like the name states, this product is different from trainers designed to look like a golf club. Instead the Powerchute takes a real club from your bag and attaches a parachute-like device along the shaft. When the golfer swings, the chute deploys creating resistance and drag. This design advances the golfer’s desire to build the proper muscle structure associated with the golf swing. Awarded with the prestigious Golf Digest’s Swing Trainer of the Year twice, the golfers that swear by the Powerchute believe the special design makes it a cut above the rest. For those golfers looking for something smaller and more compact, the Tac Tic Elbow Golf Swing Tempo Trainer is the product to find. This trainer attaches to the forearm and elbow of the outside arm of your swing. For the right handed golfer, the Tac Tic will go on the left forearm and elbow. The Tac Tic Elbow Golf Swing Tempo Trainer is one of the best golf swing trainers on the market for players looking to correct this flaw and promote proper arm placement at impact. The best golf swing trainers can be an effective and inexpensive method of improving your swing without a coach. Any of the top swing trainers we’ve looked at here are sure to help bring your game on and take it to the next level.